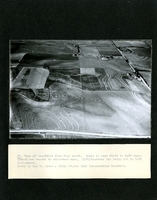 View from the west looking east showing field divisions on the Gipe and Mansfield farm. Photo taken by Ray W. Jones - Mills County Soil Conservation District. 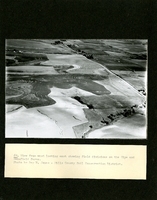 Field patterns and practices on the Mansfield farm - of the Gipe, Mansfiled, Hathaway Group. The east and west divisions show and the north and south divisions will be established in 1949. View of the Bert Wheeler farm, from south looking north. This complete plan now has sixteen miles of terraces. Modified strip cropping on the Glynn land in background. View of the Mansfield farm from the south. 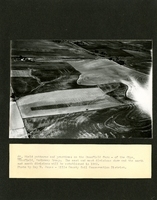 Spots in the corn field at the left foreground are caused by volunteer corn. Alfalfa-brome hay being cut in left background. Photo by Ray W. Jones - Mills County Soil Conservation District. 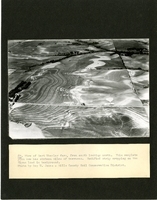 General view of Warren Gregory farm. 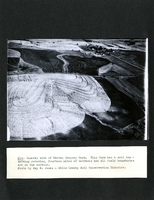 This farm has a soil conserving rotation, fourteen miles of terraces and all field boundaries are on the contour. 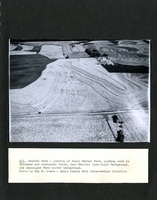 General view of a portion of Reuel Harmon farm, picking corn in a terraced and contoured field. Bert Wheeler farm right background, Joe Munsinger farm center background. Photo taken by Ray W. Jones- Mills County Soil Conservation District.